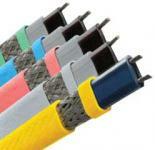 Heat tracing cables can be used to heat up or maintain the temperature of pipes. Heat tracing is also an ideal method of frost protecting long lengths of pipework and even snow melting and ice prevention of ramps, roofs & gutters. T&D’s heating cables can be used for commercial applications and also harsh industrial environments including those within potentially explosive atmospheres and hazardous areas.